← Previous Previous post: First! Is there a Lindsay St in Bentleigh or East Brighton as well as McKinnon? Or was the sign put up along way from McKinnon? Life is full of mysteries! Orwell would be proud, even better would be double plus good awesome. That’s the best garage sale sign I’ve seen in a while. Big, bold and legible. Pity I missed it. 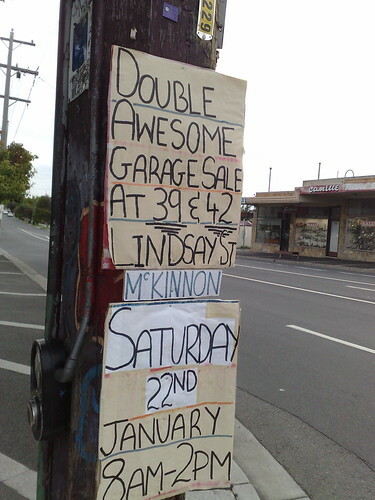 Putting up a cardboard sign on a telegraph pole advertising a garage sale is a great Australian tradition. So important to our social fabric, that the right to do it should be enshrined in the constitution. However with rights comes responsibilites. Dropkicks who don’t remove the sign following the garage sale and allow the sign over the following days and weeks to just blow away or deteriorate over time should be imprisioned for ten years. Or at a minimum the council should fine them for littering. Alternatively take direct action against them – remove the sigh, rip it into dozens of pieces then put it in there mailbox. I do. @Surburban Patriot, just as long as those signs are not placed on any light poles- that’s illegal!